I found a blog (Ain’t No Ninny) that doing the artist’s answer to NaNoWriMo or NaBlaPoMo – they’re showcasing art they were doing every day in November. I like theme-y things, and I like this idea, so I googled Art Every Day Month, or AEDM. I found this artist’s blog post about creating art every day in November. Fortunately, this artist had a very generous idea for what constitutes art, so it includes anything creative – writing, photography, endurance crocheting, synchronized interpretive dancing, you name it. We can do that! (I mean both me and you, reader!) I mean, we’re already writing a lot, or at least we want to, right? I’m going to merge my NaBloPoMo and AEDM, though I’m going to be more faithful to the NaBloPo since I started it first. 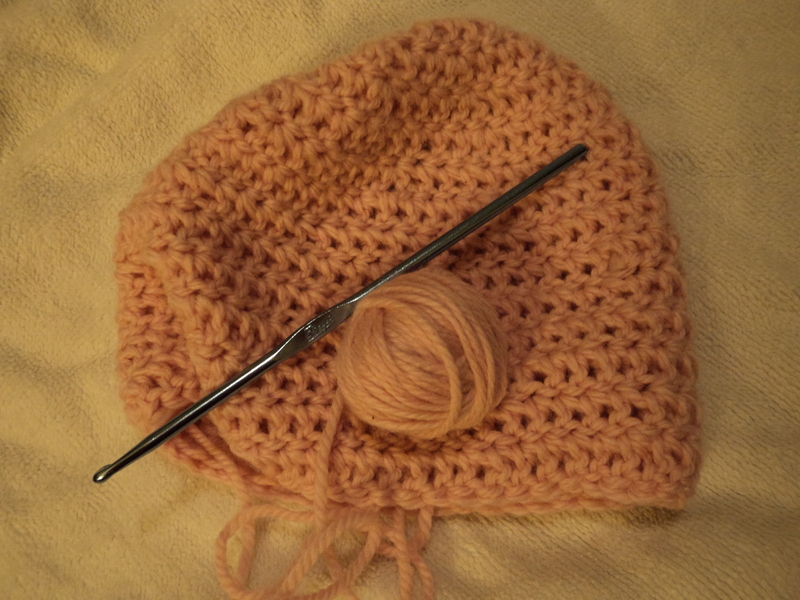 With this introduction in mind, I would like to show you something I’ve been working on: a hat for my Wee One. She’s coming at the end of February, when it’s cold, and she’ll need something. I used a wonderfully soft merino wool that Cohiba bought me a few years ago, so it’s like something both of us gave her. Moveover, it’s the first thing I’ve made her, and, when I was working on it, I thought about her little head, how it would feel on her, imagined putting it on her. I hadn’t spent too much time imagining raising her or just being with her before this (I was just so busy freaking out and being overwhelmed), and it was nice to daydream about her. Pregnant ladies are supposed to do that, right?